It was a mild, late-December day, and snow had finally blanketed the ground. I wanted to see winter in the mountains — boulder creases highlighted by mini snow piles and rock walls draped in rippled ice. I found what I was looking for in the rugged depths of High Falls Gorge. From state Route 86 the gorge doesn't look like much. One can see the split in the earth, and it's clear from the swiftly moving river there's something going on deep within it, but it can't be seen from the road. To get the full effect I had to descend into the chasm, where a world of thrashing water and wind-sculpted ice formations awaited. Adirondack gorges can be as difficult to reach as mountaintops. They might not require as much elevation gain to reach but some, like Indian Pass, are remote and littered with house-sized boulders, making them daunting to navigate. Since the attributes that make gorges so inaccessible also make them highly desirable places to visit, seeing them up close isn't for everyone. That's where High Falls Gorge comes in. The attraction's walkways, stairs, bridges, and handrails make exploring the gorge safe for a wide range of ages and abilities. There's another connection there: Educational signage about the ecology and geology of the area abounds along the gorge's trails. Wildflower identification, forest classification, and geologic wonders are all explained in clear, simple terms. But this is winter, and the gorge was alive in a different way. The mosses were covered in snow and the common polypody ferns were trapped in ice, their thick, evergreen fronds clinging to the cliffs and patiently waiting for a reprieve. Meanwhile, a raging torrent sent a fine mist airborne — minute droplets straight from the Ausable River, cold and ready to cling to any surface they touched. I crossed the bridge that's accessed directly via the back of the High Falls Gorge visitors center and paused midway across it. Behind me was the snaking cut of Wilmington Notch, its cliffs stretching up into the day's low-lying fog. In front of me was a wild river, rapidly tumbling toward the precipice of the Main Falls. There was a fork on the other side of the bridge. Left led to a campfire and marshmallows — I saved that for last and instead followed the riverbank to the gorge. A wheelchair-accessible path veers off to the left from this path but I went right, where there are sneak peaks of the waterfall through the trees. They're nothing compared to the scene from the first viewing deck, though. It's a steep climb down a stairway to get to the vantage point, but it's not as daunting as it looks. 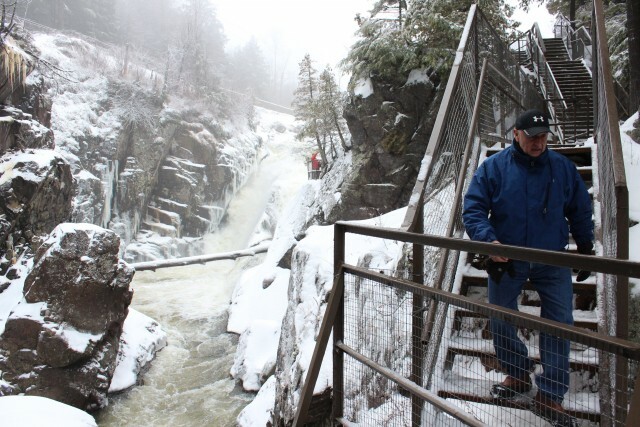 That's because High Falls Gorge staff provide everyone with traction devices, which stretch over whatever you're wearing on your feet. They're simple, effective devices that facilitate a surprising amount of traction on winter-encrusted surfaces. I recommend trusting the traction and curbing whatever hesitation you have to meet the waterfall head-on. There aren't a lot of places where you can stand face-to-face with such a wonder, and there are few things more awe-inspiring, or humbling, than feeling the breeze and hearing the roar a waterfall of this size creates. It's a thing of power, for sure. There is only one way back to the main trail, and that's back up the stairs. From the top of the stairs I turned right and took another set of stairs down into the gorge. I've visited plenty of backcountry chasms, but I'm always either looking down from the lip of some crag or staring up from between the jumbled boulders of a natural, abstract sculpture garden. It's rare to walk along a catwalk that's secured midway up the cliff, and it's a fantastic way to traverse a gorge. High Falls Gorge was busy the day I visited, but even with so many people passing by, the high rock walls offered a feeling of seclusion from the outside world. It's a feeling I usually have to hike several miles to obtain, and I relished in finding it so easily here. The trail through the gorge makes a nice loop, giving visitors different vantage points of churning waters, blasting falls and ice formations seemingly shaped by deft hands. Part of exploring nature is being surprised by whatever's waiting around the next bend, so I'll stop short of describing every jaw-dropping wonder I saw. 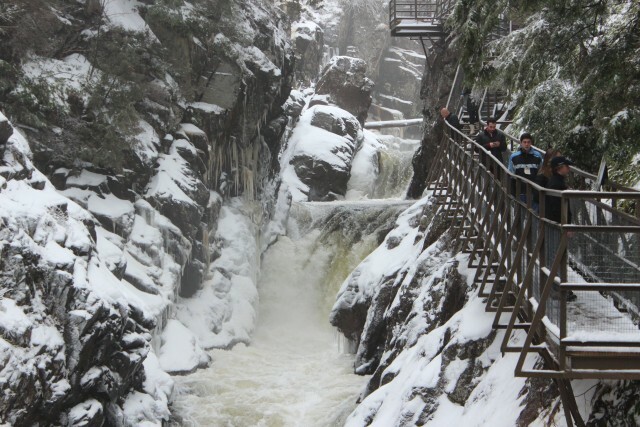 Go explore High Falls Gorge and see for yourself. 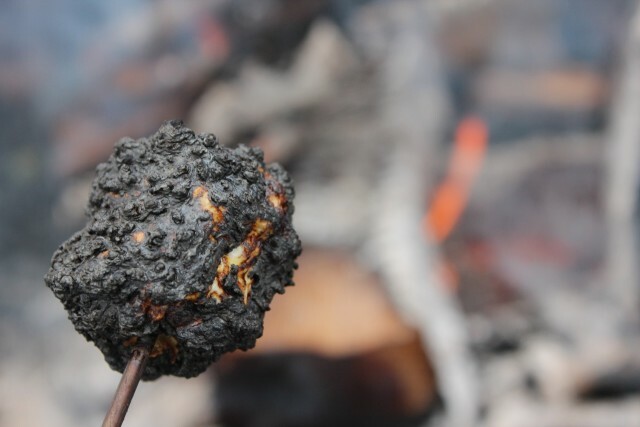 And as you loop back around, don't forget to roast a few marshmallows over the fire before heading back into the visitors center where the River View Cafe, a gift shop, and a replica mining operation await. 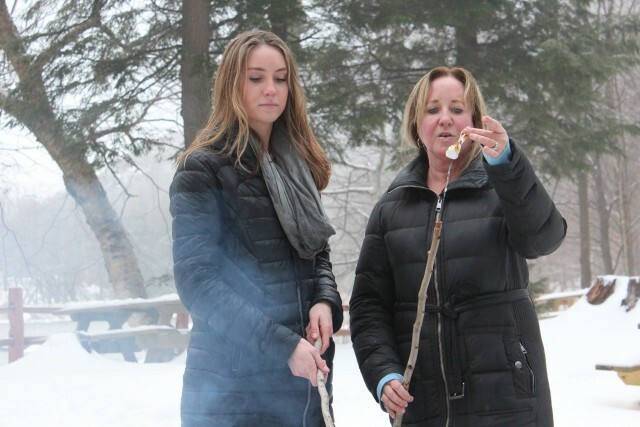 If the journey through the gorge makes you want to see more, you can rent snowshoes and embark upon one of two nature trails that loop around the 22-acre property. Want more? Check out these nearby hiking options. Looking to get in from the cold? Go shopping or check out some local art! There's plenty to do in the Whiteface Region!